I’m sick. I don’t think it’s the dreaded you-know-what. It’s probably just a common cold. In fact, I’m already on the mend. Regardless, if I do the cyclocross race tomorrow, I’m going to end up sick as a dog next week. 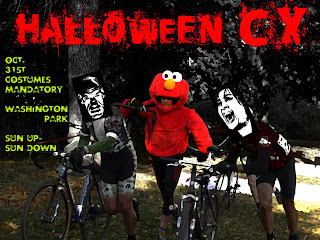 I wouldn’t mind so much were it not for the fact that tomorrow’s race is one of the most fun races of the entire year – the Velo Trocadero Halloween Classic. Last year’s race was an absolute blast. There’s nothing like a bunch of costumed weirdos bunny-hopping a burning barrier and being heckled by an enormous, diaper-clad man-baby in 40-degree weather. Illness notwithstanding, I will be at the race tomorrow, but I’ll be packing a video camera instead of a bike. Hopefully I’ll capture something YouTube-able. I just hope I don’t see anything as shocking as Katy’s 2008 costume (I looked for a photo, but mercifully, couldn’t find one). Looks like she’s going high-class this year.